How to garden during a drought with a hosepipe ban. Use a watering can during a drought to control distribution. When the sun shines and spring is in the air, many of us are tempted into the garden once more. Lovely warm weather makes everyone want to be outdoors. You want to enjoy the colours and beautiful forms of the plants you have chosen for your beds and containers. Sometimes the warmer summer conditions are accompanied by drought orders and hosepipe bans (TUB’s). So can we garden without a hosepipe? Yes, and we have put together the best tips we can to help you enjoy your plants and garden and help the environment and wildlife too. The good news is that watering of gardens is not prohibited. It is important that we continue to plant summer flowering bedding plants as these are important source of nectar. A drought will be already badly affecting flowering plants in the wild. It is also important to choose the right plants for the right place, that will withstand drought conditions better. Plants that have been raised under the same conditions as your garden can also help then establish better and be more resilient to drought. By selecting Home Grown plants, you can be assured that they have been raised by British nurserymen in the UK and often locally to you. Use a watering can instead of a hose. Young root development in a rooted cutting- building a root system in drought conditions. You can direct the water flow more carefully to the plants’ base and roots. 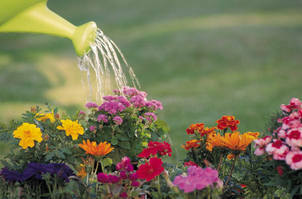 Watering, especially at cooler times of the day, with a watering can will reduce evaporation losses. You can vary the amounts given depending on the size of the plants (and their root ball). How to water less frequently. Take care not to splash foliage especially on hot days, this will avoid any leaf scorch. Apply adequate water at individual waterings. This will avoid having to re-water at short intervals. Longer watering will encourage plants to root into lower levels of the soil; the resultant improved root system will benefit the plants in dry weather. Where possible, select species recommended for dry gardens. That is varieties that will do well in drought conditions. How to plant for a drought. Prepare the soil well with adequate cultivation. Incorporate adequate organic material where possible to hold water in the soil. 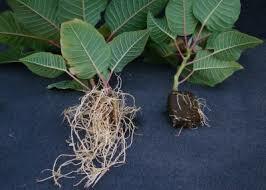 Plant sufficiently deep to promote root development throughout the soil profile. Use mulches of compost or bark chippings in a layer of a few inches to reduce surface water loss from evaporation and keep the roots cool. How to care for plants after planting. In extreme cases, you can plant through a plastic mulch sheet; this will often help reduce weed growth and keep your plants moist at the roots. Select plants which are more developed and have a larger and stronger root system. Keep watering plants regularly for the first 14-21 days after planting to ensure that they establish properly in the ground. In some container ‘composts’, you can incorporate gel granules that absorb water. These will give it up later when water is required by the plants – useful for hanging baskets. Anywhere, but particularly in containers, water dry soil 2 or three times as the first watering may run straight through. Dry soil can shrink away from the sides of containers. Open the planting hole, at least 2x the diameter of the root ball and place in the plant at the correct depth. This is usually with the rootball top surface level with the edge of the planting hole. Fill the hole with water and allow it to percolate into the soil, maybe repeating it once if soils is very dry. Complete filling in the soil and press lightly to ensure that the re-settled soil will conduct moisture thorough to the plant’s roots. For the first 14-21 days following planting, continue to leave a raised ring of soil around the newly planted item and when watering, fill that ring of soil to the depth of 3-4 inches with water and allow time for it to be fully absorbed. Similarly, when watering patio containers and baskets, it may be necessary to leave the plants in a full drip tray of water. It is often useful to add liquid fertiliser. Plants can then absorb water which would otherwise run through dry ‘compost’. How to care for lawns. Raise the cutting bar during hot weather to avoid damaging the grass plants which will otherwise take longer to recover. If you cut your lawn in hot weather, remove the cuttings. If these are left, they could encourage conditions where fungal diseases develop quickly, especially in warmer conditions.